We are a friendly group, with many differing interests and backgrounds. 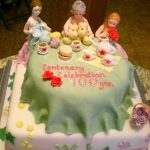 Some of us are creative, some of us make wonderful cakes, it’s even rumoured that some of us make jam, but many of us don’t do any of those things – and we only sing Jerusalem on special occasions! 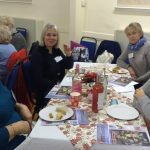 Framfield & Blackboys WI offers company, laughter and fun, outings and shopping trips, events where you can try new skills, and interesting and inspiring speakers. 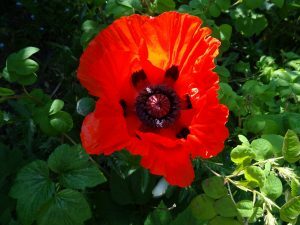 We meet in the evening on the second Tuesday of every month either at Framfield Memorial Hall or Blackboys Village Hall (see FF or BB in our programme). 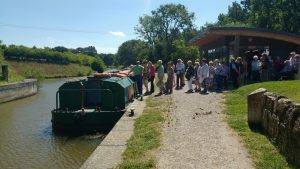 Why not come along to one of our meetings and see for yourself. You can be sure of a warm welcome. Both venues are wheelchair accessible. 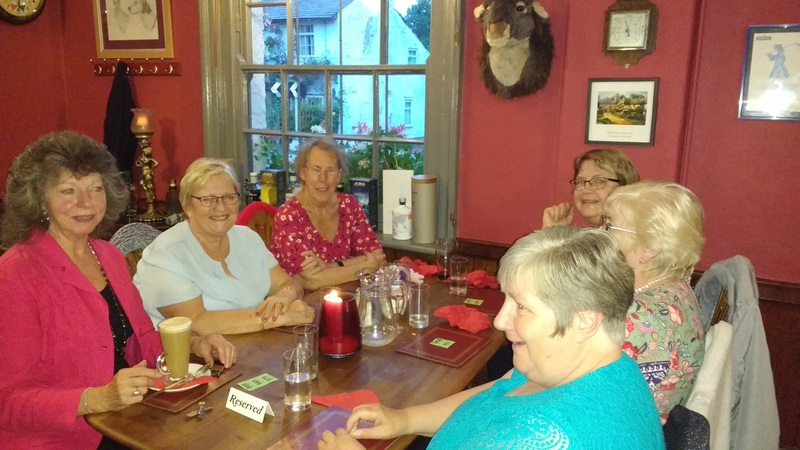 Members of Framfield & Blackboys WI gathered at the Hare & Hounds in Framfield for a farewell lunch with landlords Annie and Phil Saunders who are retiring shortly. During their time there, they’ve re-established the Hare & Hounds as a popular eating venue. 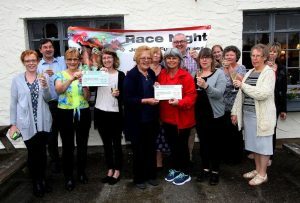 Annie and Phil have also been very supportive of WI activities including co-hosting two race nights which raised over £1,400 for local charities. 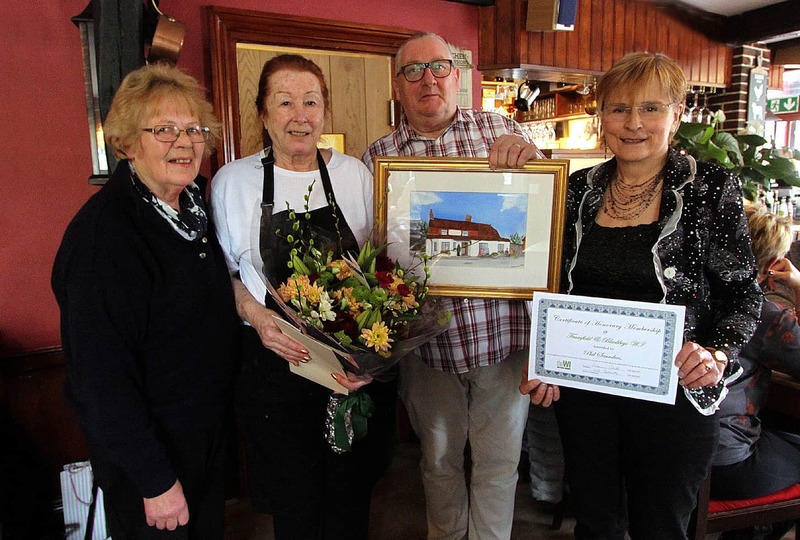 A picture of the pub in watercolour, painted by WI President Philomena Whittle, was presented to the couple together with a certificate of honorary WI membership and a beautiful bouquet of flowers. We wish Annie & Phil a long and happy retirement, and look forward to welcoming new landlady, Lorraine and her husband, to the village. Ron Hill kindly came and took photographs of the occasion which is particularly appreciated as he was feeling unwell at the time. He was rushed to hospital the following morning having suffered a heart attack. From his sick bed he arranged to have the photos published on Uckfield FM. We all wish Ron a full and speedy recovery. Magistrate, Sally Ann Hart who previously gave us a fascinating insight into the workings of the Magistrates Court, returned to conduct a mock trial. 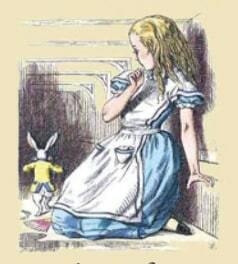 A previous trial had collapsed & the court decided, at very short notice, to hear the case of Regina versus Alice in Wonderland. All parties, who had very little notice to prepare, had to attend and give evidence immediately. It must be reported that all the court officials – Judge, Court Clerk, Crown Counsel & Defence Counsel carried out their duties with gravitas and due diligence. The two Counsels did their best with witnesses who, it has to be said, had not quite got their thoughts in order. However acting skills and enthusiasm more than compensated for their lack of coherence. 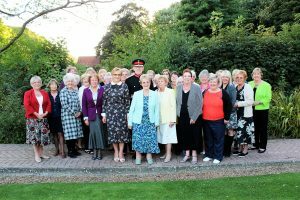 The jury was slightly unbalanced as they were all ladies of the WI. The jury foreman was at a total loss when there was a split decision. Alice was obviously guilty, albeit with mitigating circumstances; curiosity!! Well, we all know what that did!!. Sentencing was adjourned until all previous probationary reports were heard and character witness statements obtained. Her age and home circumstances were also to be taken into account. Alice, aka FAB WI President, may request leave to appeal as she feels that the jury foreman, aka FAB WI Vice President, exerted improper influence on the jury. This month’s competition was a flower arrangement in a mug which was won by Gill Roberts with her beautiful arrangement of grape hyacinths. ‘What Makes a Superstar’ was the intriguing title of Simon Mott’s talk at our March meeting. We were treated to a whistle stop tour of the life of Annunzio Paolo Mantovani complete with photographs, videos and extracts from his recordings. 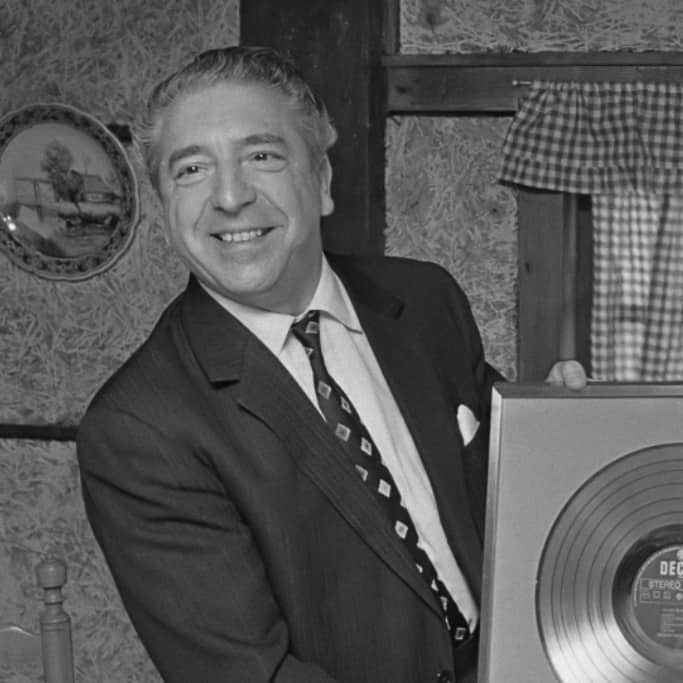 Simon explained how Mantovani achieved his initial success and how he adapted over time to remain a phenomenally popular recording star. There was an endearing twist at the end of the talk which I will leave people to discover for themselves when they hear Simon speak. Traditionally we have a ‘bring and buy’ sale at our February meeting with the proceeds going to our Treasure Chest which funds flowers for members who’ve been ill.
As our meeting took place on Shrove Tuesday, our competition for the month was a walking pancake race. This involved walking the length of the hall and back, tossing a pancake at least once in each direction. The race ended in a dead heat between Valerie and Philomena. Valerie was victorious in the ‘walk off’ and is seen here giving a celebratory toss of her pancake. 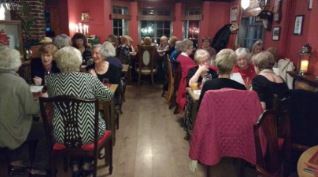 We kicked off 2018 with our New Year Dinner which we held at the Hare & Hounds in Framfield. 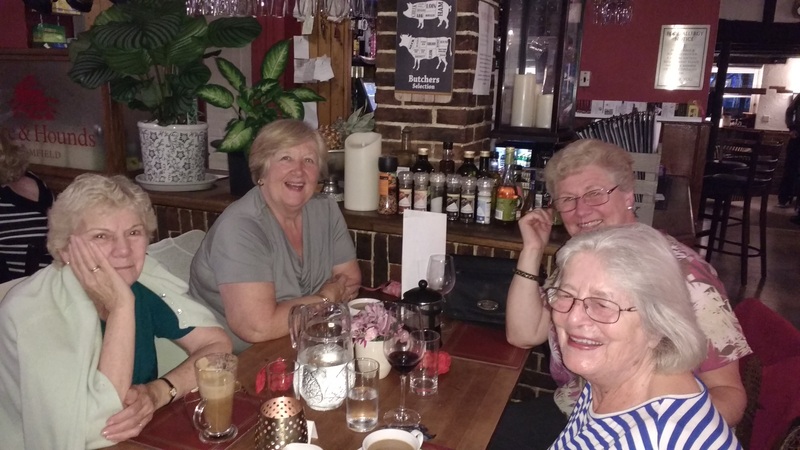 Both the food and the service were excellent as ever and an enjoyable evening was had. Gill ran a raffle with a single mystery prize which was won by Adrienne. 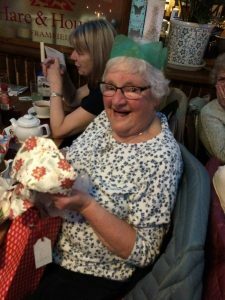 Her face was a picture when she unwrapped it to find a large bottle of water – but hidden underneath was a Waitrose voucher for £15! Our dear friend and much valued member, Carolyn Pettit, passed away just before Christmas following a short illness. Elegant, generous, vivacious and fun loving, Carolyn was also thoroughly professional and fastidious in everything she did. She loved life, ballet, the theatre, music, literature, dancing, shopping, red wine, chocolates and shoes – shoes with butterflies, open toe boots, stylish sandals – a stunning collection of about 100 pairs. She will be greatly missed and the world is a duller place without her. At our Christmas party, comedy duo Terry & Rich entertained us with a quiz with a difference. 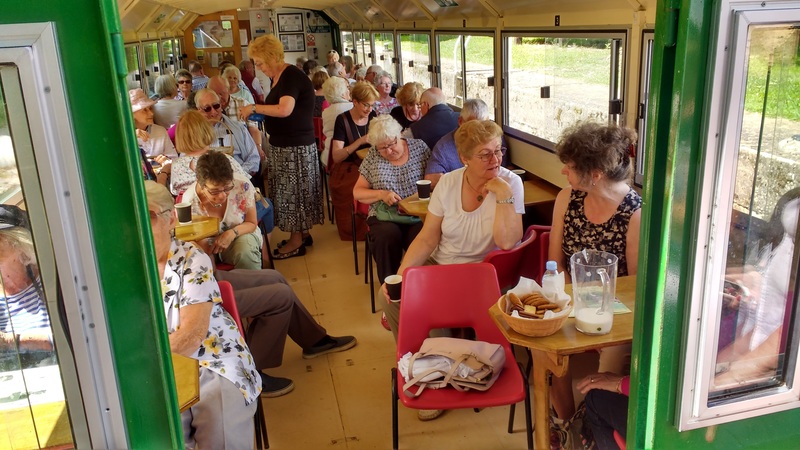 There was a delicious buffet provided by members and we were joined by guests from Buxted and Fourways WI’s. 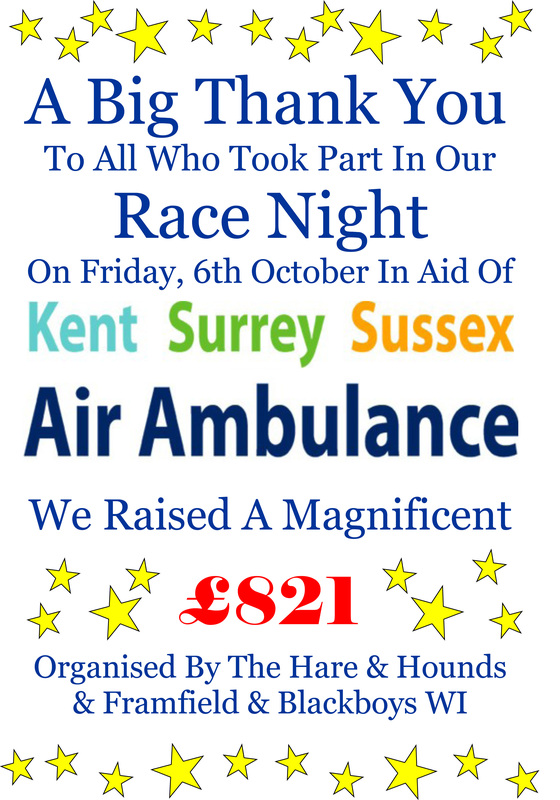 Our Race Night in aid of Kent, Surrey & Sussex Air Ambulance on Friday, 6th October, raised £821 in total. 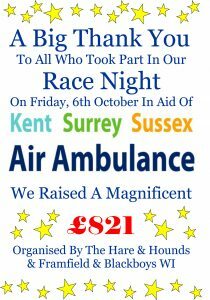 Everyone who attended contributed most generously, particularly the winner of the Tote who donated his winnings of £120. Other people also donated their winnings. We had a raffle with lots of great prizes donated by WI members, Annie & Phil at the Hare & Hounds and local businesses. The food was excellent, and Annie and Phil and all the staff ensured that we had an enjoyable evening. 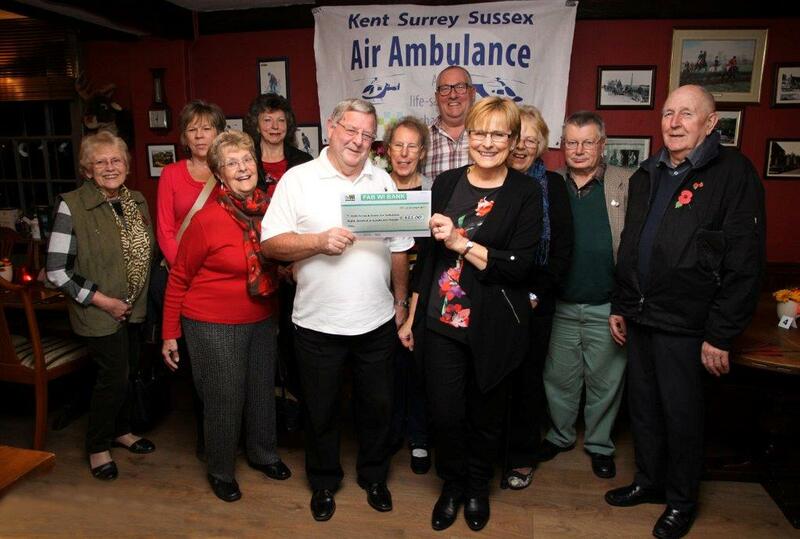 Following their Race Night in aid of Kent, Surrey & Sussex Air Ambulance, members and friends of the WI gathered at the Hare & Hounds on 1st November to present a cheque for £821 to Dave Winsor of the Air Ambulance. Attending the presentation were Phil Saunders, Mine Host Hare & Hounds, Dave Winsor, Air Ambulance, Philomena Whittle, Gill Roberts, Sheila Wilkins, Joyce West, Mary Short, Pat Cottingham, Karen Hillman, Arthur Roberts and Brian Short. The speaker at our September meeting was Ben Cross of Crosslands Nursery where they specialise in growing alstromerias. 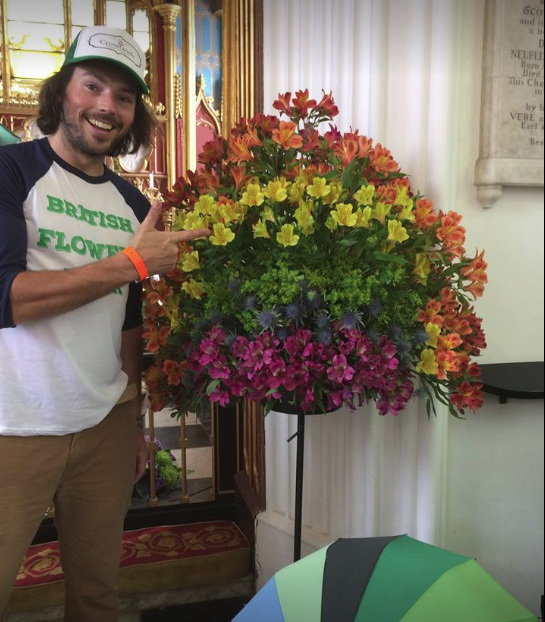 His talk gave us a detailed insight into the process of growing alstromerias and the issues faced by the British cut flower industry in the face of foreign imports. Ben also brought along bunches of alstromerias for sale and they were quickly snapped up at the end of the meeting. 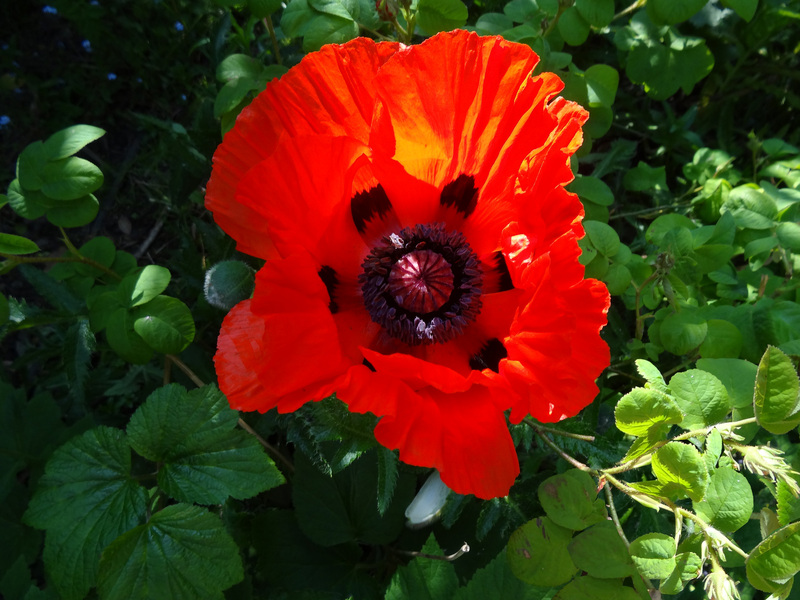 Ben judged our competition which was ‘My Favourite Photograph of a Flower’, which was won by Philomena’s photograph of a poppy. 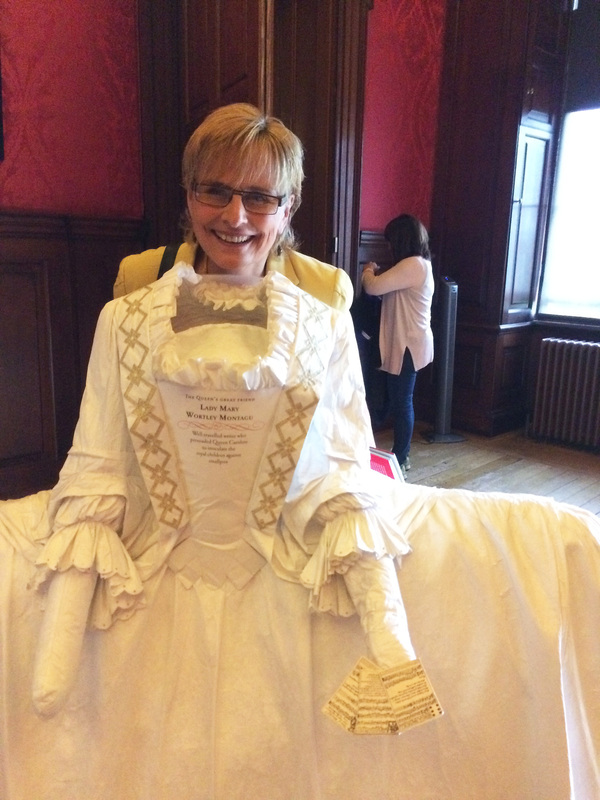 We had a wonderful day at Kensington Palace. The Diana Exhibition more than lived up to expectations, with the dresses displayed in an intimate, salon-like space. 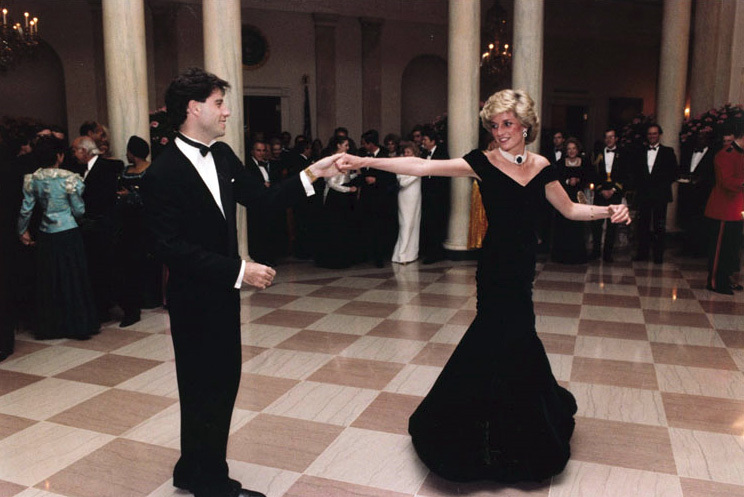 A placard beside each dress gave the name of the couturier, a photograph of Diana and a list of the occasions when she wore each dress. Most of the dresses were worn on more than one occasion. 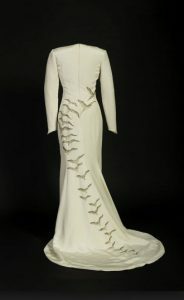 The exhibition included the dramatic ‘falcon’ dress designed by Catherine Walker, featuring the falcon, the country’s national bird which the princess wore on her visit to Saudi Arabia, as well as the iconic blue velvet gown which Diana wore to a ball at the White House when she danced with John Trevolta. 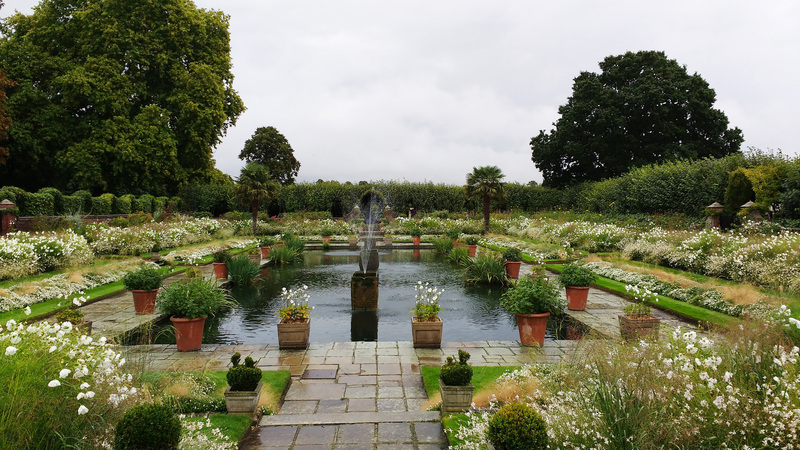 The rain held off just enough for us to be able to see the White Garden which was absolutely captivating. There were also three other exhibitions at the palace. 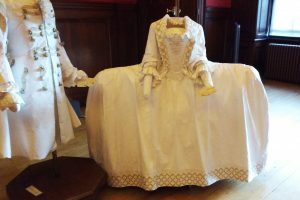 The Queen Victoria Revealed exhibition reminded us that Queen Victoria was born at Kensington Palace and lived there until she became queen at the age of 18. The King’s Apartments and The Queen’s Apartments exhibitions showed aspects of life at Kensington Palace from its transformation from a country house by William and Mary to Georgian times when an extraordinary dress called the mantua was de rigueur for attendance at court. Only the grand palace doorways and staircases were wide enough to accommodate their hooped skirts without turning sideways. When travelling to and from the palace, ladies flipped up their whalebone hoops so they could fit into their sedan chairs, giving them the appearance of strange winged insects. Some of us just weren’t able to resist the temptation ….. The weather was kind and we all had a good day at the 2017 Framfield Show. Our WI Wine Challenge was a great success. There were a number of wine bottles some of which were still full of wine while most of them were filled with coloured water. For the payment of £1, if you could pick out a real bottle of wine, it was yours to keep. We also had a ‘Guess the Weight of the Cake’ competition which was very popular. 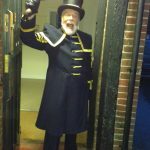 Our July speaker was Peter White, Town Crier of Seaford, who gave us a very entertaining talk about the history of the office of Town Crier. 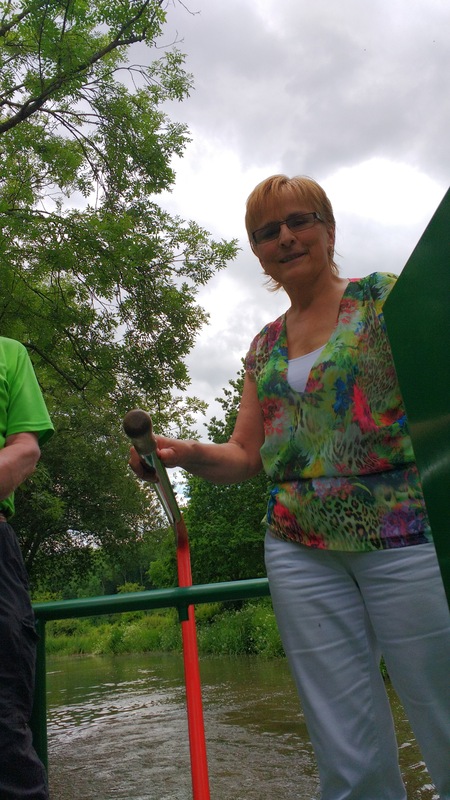 Our competition for the month was for the best bell, judged by Peter White and won by Pat Cottingham. 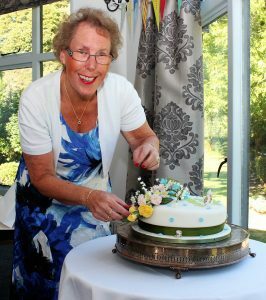 Gill Roberts had an unorthodox take on the competition with her Million Bells floral entry. 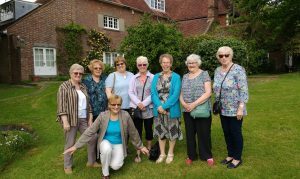 We had a private tour of Penshurst Place as our 2017 July outing. 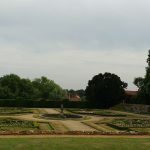 It was a lovely sunny day and we all enjoyed exploring the beautiful gardens before our guided tour of the house. 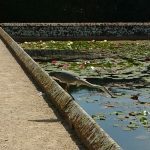 We were amazed when we came through the archway to the lily pond to find a heron perched on the edge less than 4 feet away poised to catch some hapless fish! Penshurst Place was built in 1341 and is described as “the grandest and most perfectly preserved example of a fortified manor house in all England”, The house is the ancestral home of the Sidney family, and was the birthplace of the great Elizabethan poet, courtier and soldier, Sir Philip Sidney. Penshurst showcases a marvellous mix of paintings, tapestries and furniture from the 15th, 16th and 17th centuries. The Baron’s Hall was used as a set for the film ‘The Other Boleyn Girl’ and ‘The Hollow Crown’. Our charming and knowledgeable guide, Janie Wellbourne, gave us a vivid account of the history of the house and its various owners through the generations. Almost 50 members and friends of Framfield & Blackboys WI joined our narrowboat cruise on the Wey and Arun canal followed by a visit to Arundel to view the carpet of flowers in the Cathedral. There was free time to explore the delightful town, have lunch, drink coffee, and of course to check out the shops. A certain shoe shop experienced very brisk business towards the end of the afternoon with three members climbing on to the coach for the journey home triumphantly clutching identical bags – some containing more than one purchase! To avoid any panic, most people didn’t know didn’t know that Philomena was at the helm for part of the cruise, but the event was organised impeccably by Gill who did find a moment to relax during our trip. On Thursday 23rd May a group of members visited Farley’s House and Gallery at Chiddingly, which was home to Lee Miller and Roland Penrose for 35 years. Lee Miller’s surrealist images, portraits and extraordinary combat images from World War 2 have earned her a key place in the history of art. Roland Penrose was a surrealist artist, friend and biographer of Picasso and co-founder of the Institute of Contemporary Art. He was knighted in 1966 for his services to visual arts. 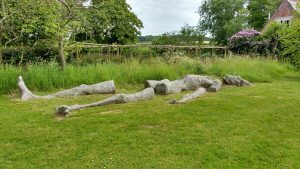 The couple moved to Farley’s House in 1949 and their home became a magnet for contemporary artists including Picasso, Man Ray, Max Ernst Leonora Carrington and Joan Miro. Some of the works on display were created during their visits. 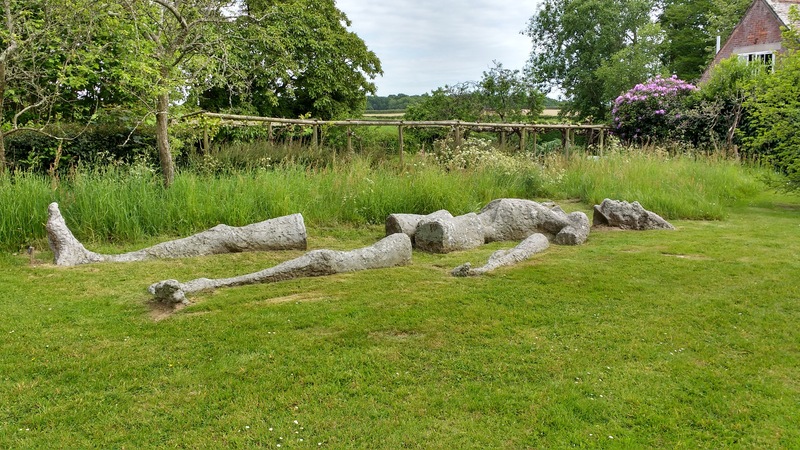 The fallen giant is one of the many sculptures on display in the garden. The WI and the Hare & Hounds in Framfield co-hosted a race night as a fundraiser for the Framfield & Blackboys pre-schools and it was a fantastic evening. Over 50 people had bought supper tickets and about another 30 people joined in from the bar. Racing was shown on two large TV screens, bets were placed, and the noise was deafening as everyone cheered on their chosen horses. A supper of piping hot sausages and crispy melt in the mouth chips was served in the midst of the bedlam. The horses in the last race were auctioned and the bidding was fast and furious. 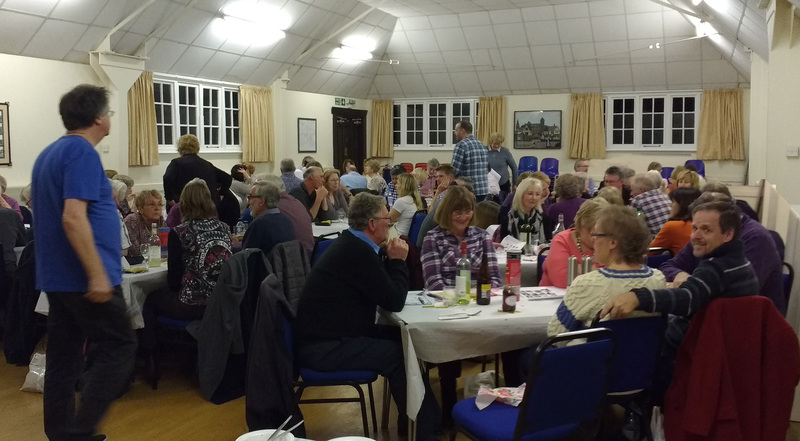 The evening raised £600 for the two pre-schools. 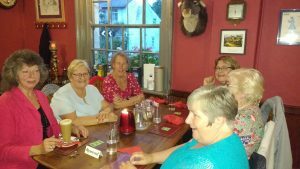 The WI returned to the Hare & Hounds on Tuesday to present cheques for £300 to Jenny Novkovic, Manager of Blackboys Pre-School and Donna Hills, Manager of Framfield Pre-School. WI President, Philomena Whittle and Events Co-ordinator Gill Roberts along with Annie & Phil from the Hare & Hounds presented the cheques. Donna was accompanied by Sarah Ridley from Framfield Pre-School and Jenny was accompanied by Bethany Wright, Becky Dilley and Goldi Novkovic from Blackboys. 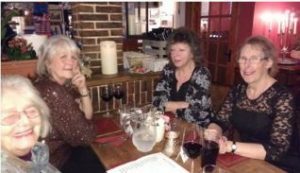 Annie & Phil said “We are delighted to join forces with our local Framfield & Blackboys WI in raising money for our pre-schools. We look forward to fundraising together with them for other good causes in the future”. 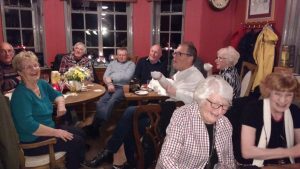 Our April meeting took place at Blackboys Village Hall. There was a great deal of correspondence from both ESFWI and from NFWI. Volunteers were sought to lead next month’s debate on this year’s resolutions, ‘Alleviating Loneliness’ and ‘Plastic Soup’. Once the business had been completed Michaele Wynn-Jones took us into her world of Scarf Tying Magic and showed us some amazing ways of tying a scarf, or even two at once. Everyone joined in wholeheartedly and from time to time stepped in to rescue each other from the risk of strangulation during the more complicated exercises. The competition for the month was a Flower Arrangement in a Mug which was judged by members placing contributions for ACWW in front of their favourite entry. Sheila Wilkins emerged as winner. Phyllida and Carolyn prepared the birthday posies and were our tea hostesses for the evening with Phyllida’s delicious Florentines and cake disappearing in record time. 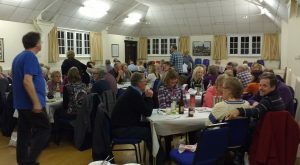 The WI held their annual Quiz Night on Saturday, 25th March in the Framfield Memorial Hall. Long term resident of Framfield, Terry Everitt, was quizmaster. He was ably and entertainingly assisted by friend and neighbour Richard Arthur and Hayley Dann checked the answer sheets and kept score. The quiz included several quirky and unusual rounds which challenged and amused contestants in equal measure. Over 70 people attended. During the interval quizzers were served generous portions of delicious, home cooked lasagne made with beef from Bird in Eye Farm, followed by a choice of desserts and tea and coffee. 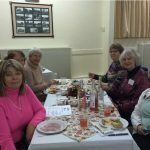 Our March meeting took place at Framfield Memorial Hall. 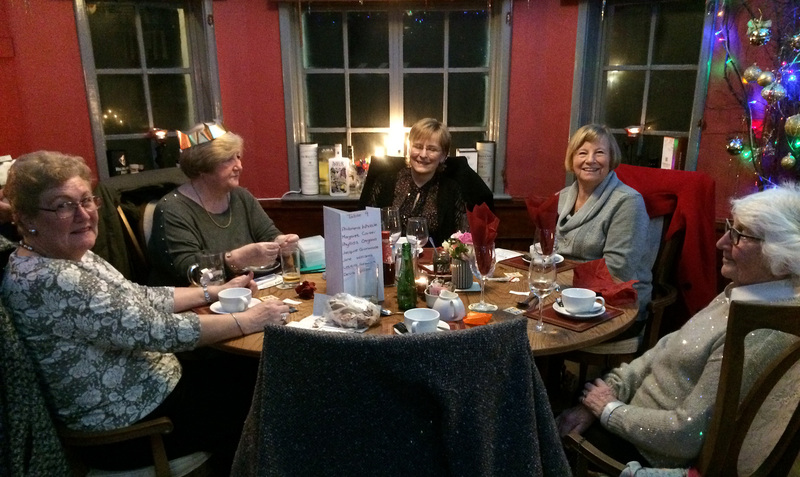 We were delighted to be joined by a new member, Letitia Newton who has recently moved to Framfield. Our speaker for the evening was Lesley Baker, lady tree surgeon. 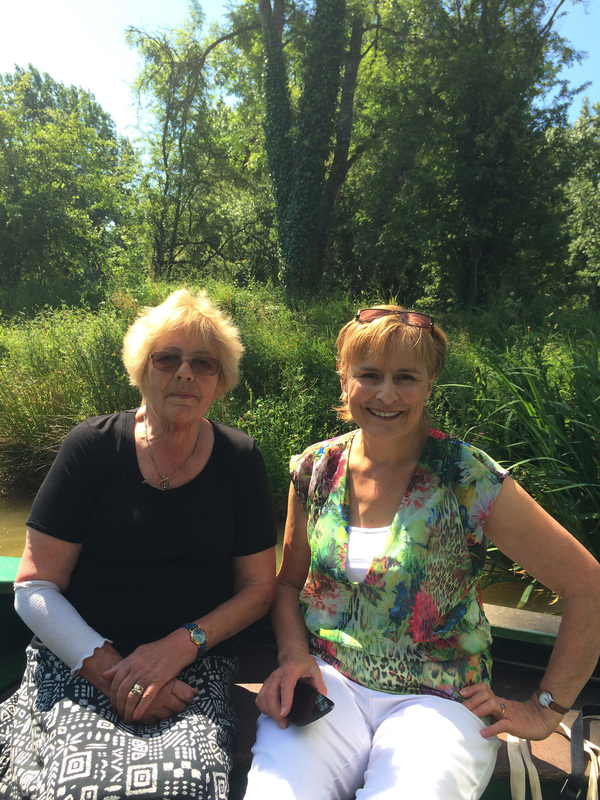 She gave us a most entertaining talk about the adventures – and misadventures – of her daily life as a tree surgeon. She told us about the prejudice she encountered from her male colleagues during her training days, which she endured with an endearing sense of humour. Then we were introduced to the inappropriately named Mary, her chain saw, a four foot long monster, which I doubt that I could lift off the ground, much less haul up a 20 foot tree. This month’s competition was a tree related photograph which was won by Alison Wright. 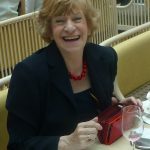 Our February meeting was held at Blackboys Village Hall and our speaker for the evening was local artist, Lyn Merrick. 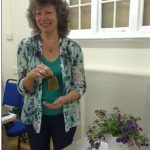 Lyn created the flora and fauna illustrations for the Ashdown Forest Visitor Centre and has also provided wildlife illustrations for Kew Gardens and the Department of Education. We were all cajoled into drawing an oak leaf and many of us were amazed and pleased with the results. 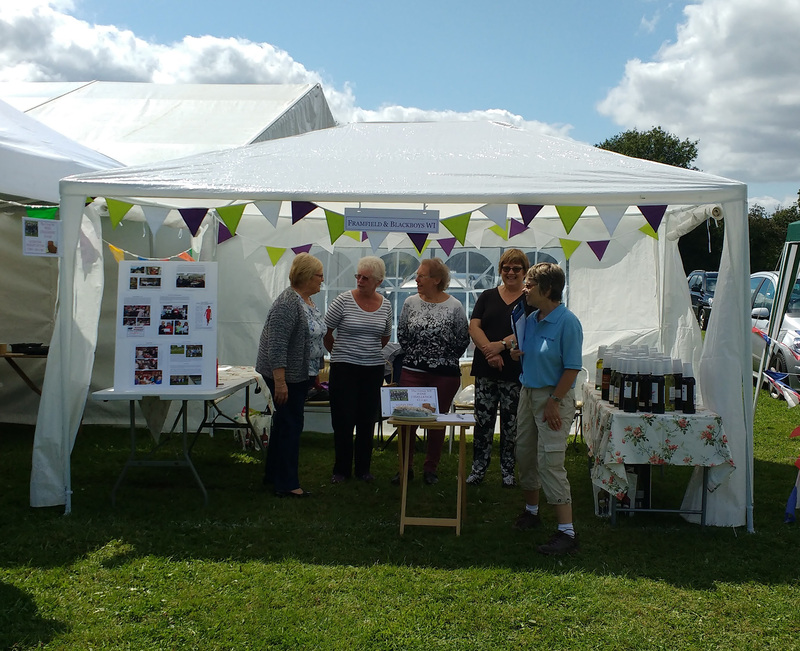 We then held our annual Treasure Chest bring and buy sale which raises funds to buy flowers for members when they are ill. This was followed by our February competition to find – surprise, surprise – the best Valentine Card. The winning entry was created by Mary Short. Mary said she’d never attempted anything creative before and was delighted that her entry was chosen. We were delighted to hold our January dinner at our local pub, the Hare & Hounds, Framfield, which has been going from strength to strength since Annie & Phil have taken over. 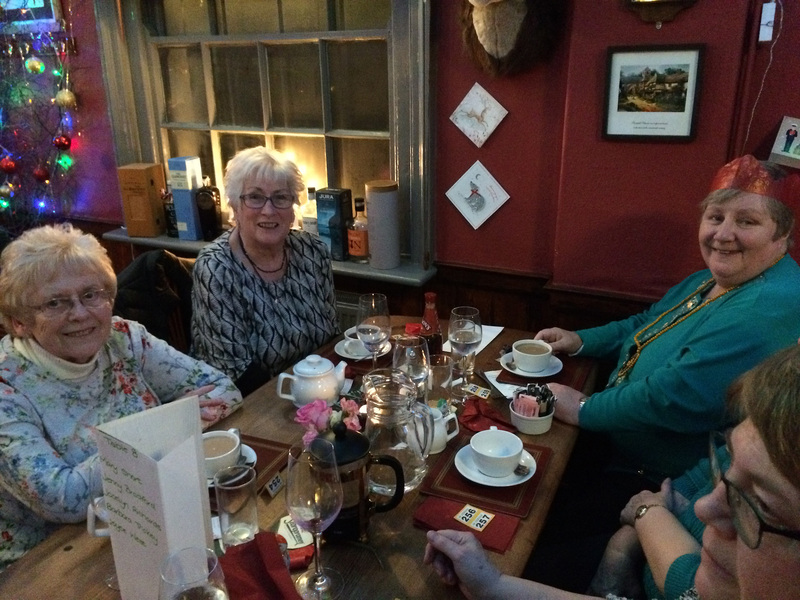 The food was delicious, the service attentive and a lovely evening was had by all. 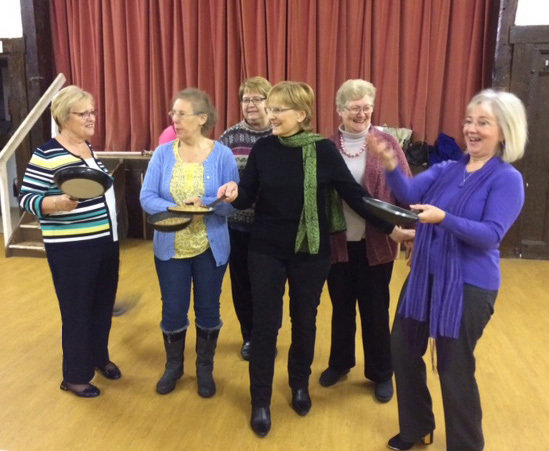 There was an added surprise of a free raffle run by Gill Roberts with everyone receiving a mystery prize. 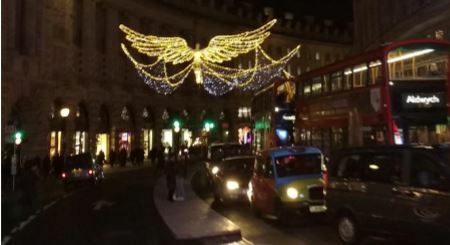 Framfield & Blackboys Christmas trip to London is becoming somewhat of an institution. On 29th November members disembarked from our coach on Park Lane and most people headed for Oxford Street. Marks & Spencer reported a spike in profits on the day and Steve, our driver, was worried about the weight limit when he saw the number of carrier bags being loaded on at the end of the day. 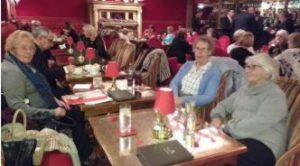 Following an exhausting day’s shopping, members relaxed in the convivial surrounding of the Four Star Rubens at the Palace where we had an excellent three course meal. 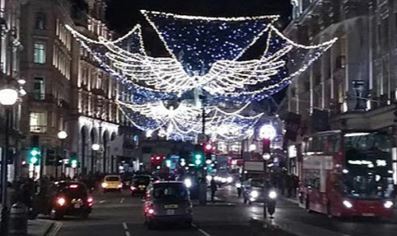 The evening ended with a tour of the lights which were absolutely magnificent. 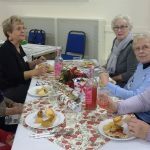 The year ended with our annual Christmas party at Framfield Memorial hall where we were joined by visitors from other local WIs. Members brought along a delicious selection of home-cooked food and great musical entertainment was provided by local musician Ian Hayler. Framfield & Blackboys WI Was founded in 1926 by Mrs Dorothy Haire, wife of the then vicar of Framfield. Fifty Five members attended the first meeting on 14th September, and membership cost 2 shillings. On 5th October 2016, current members of Framfield & Blackboys WI together with invited guests and friends gathered in the Garden Suite at Deans Place Hotel in picturesque Alfriston for afternoon tea to celebrate their 90th anniversary. 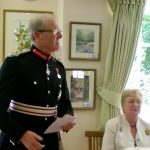 Mr Peter Field, Lord Lieutenant of East Sussex was guest of honour. 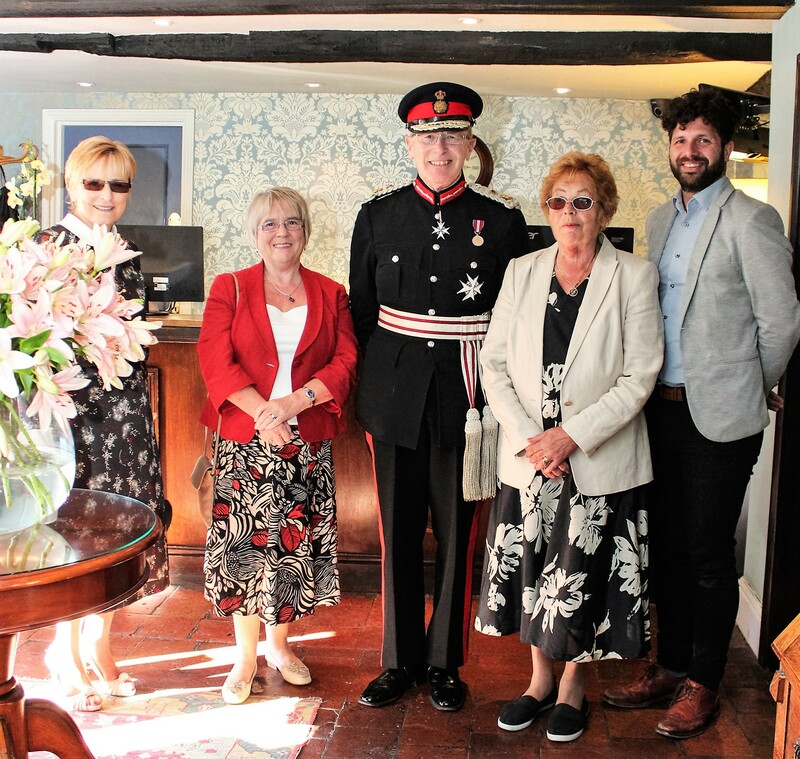 President, Philomena Whittle and Events Co-ordinator Gill Roberts together with James Dopson, General Manager Deans Place Hotel, welcomed the Lord Lieutenant and Mrs Field. In the ante room of the Garden Suite there was an exhibition of documents from the archives which prompted many happy reminiscences. 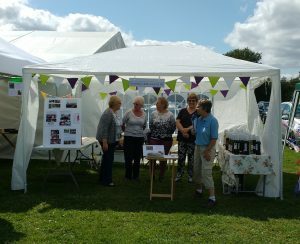 There was also a display of old photographs of Framfield and Blackboys and an exhibition of craft items made by members. 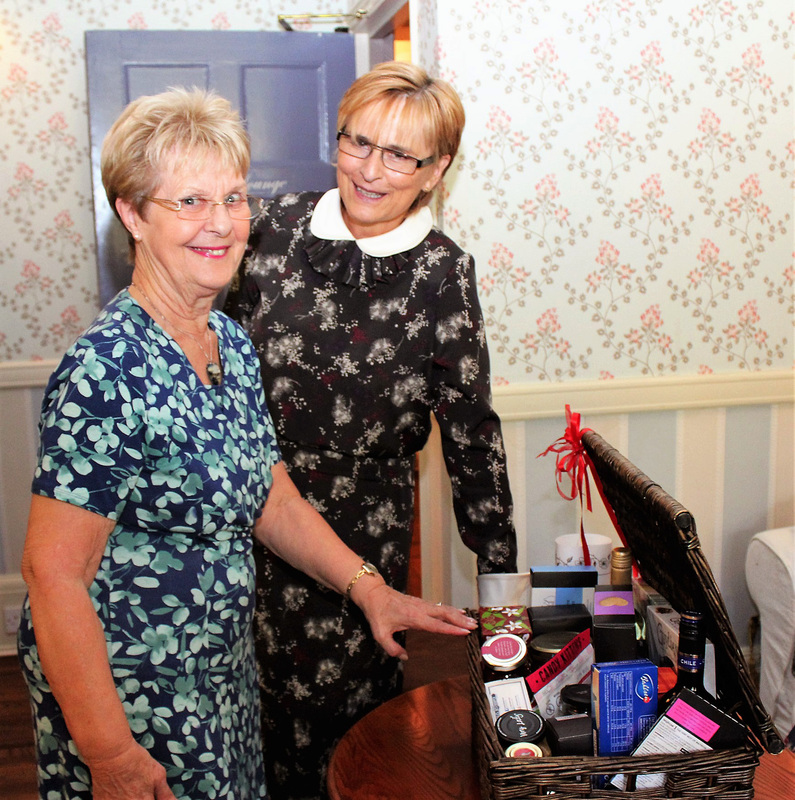 A raffle was held prior to the arrival of the Lord Lieutenant, with a luxury hamper as the prize. WI member, Mary Short was the lucky winner. 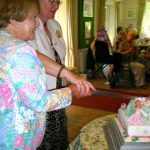 Following a delicious tea, County Chairman Gill Nokes, cut the birthday cake. The beautiful cake was made by Sheila Wilkins who also donated the ingredients. The Lord Lieutenant proposed the toast and afterwards was presented with a bottle of Blackboys Tickerage Classic Cuvée and a mini hamper of preserves and pickles from Framfield Foods. Philomena presented bouquets to Mrs Field, Gill Nokes and Sheila Wilkins. In a gesture of thanks from the members for organising the event, Delia Gillies presented bouquets to Philomena and Gill Roberts. 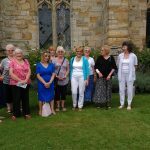 Later members and guests gathered in the afternoon sunshine in the delightful garden at Deans Place for a group photograph. The Lord Lieutenant and Mrs Field were then shown the exhibition of crafts and mingled with the guests. 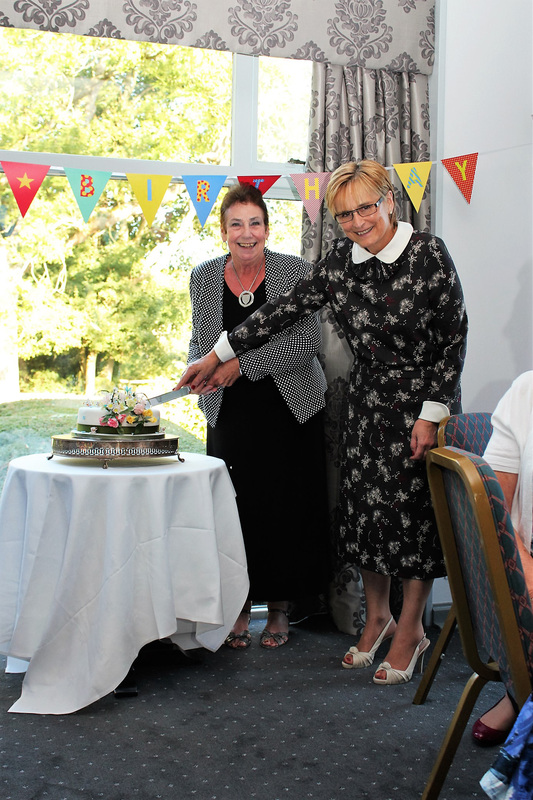 It was a wonderful afternoon, and everyone felt that we had celebrated our 90th anniversary in style.